to cause the individual insurance market risk pool to become more favorable (include more relatively healthy individuals than it otherwise would). Lower Health Care Costs – Health insurance rates will go down for everyone. Improved Health Care Efficiency – Health care cost increases should be less than the average for the country. Improved Health Care Competitiveness – Health care costs in individual mandate states should be less than in other states or countries. Yesterday I decided to compare the health insurance costs between Ohio and Massachusetts. 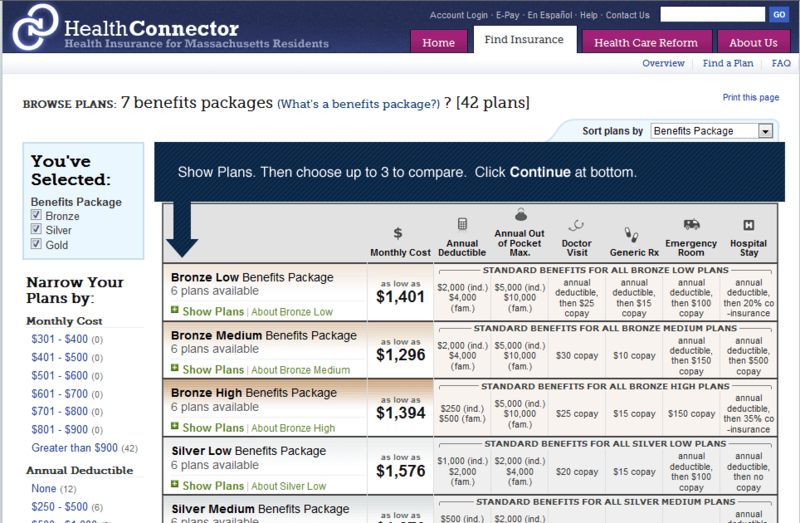 I entered my demographic data into the Health Connector for Massachusetts, www.mahealthconnector.org, and the lowest Bronze plan available would cost me $1,296 per month. In Ohio I looked up a comparable plans on www.ehealthinsurance.com. This site provides the same features as a Health Connector but does not need a government subsidy. The lowest plan on ehealthinsurance.com would cost me $305 per month. In fact there were 15 plans available for less than $400 and 55 plans for less than $600. Here is the screenshot of my insurance options at the Massachusetts Health Connector. 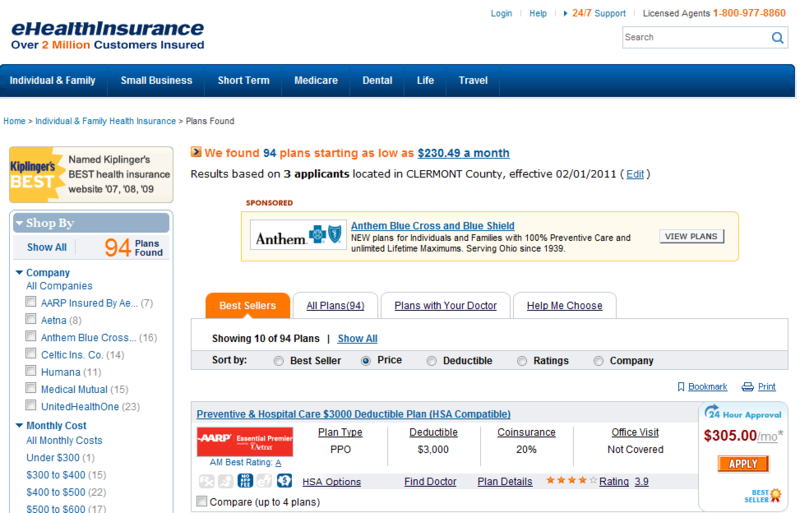 Here is the screenshot of insurance options at eHealthInsurance.com. As a healthy person I would pay an extra is $991 per month or $11,892 per year for my health insurance in Massachusetts. If you multiply $12,000 by every healthy people added to the insurance pool, Massachusetts should not any problem lowering health insurance costs. The lower insurance costs in Massachusetts didn’t happen. The expected cost benefits from reduced emergency room visits and preventative care do not appear on the bottom line either. The Massachusetts insurance prices are so far off we have to conclude that something other than the individual mandate are the dominant drivers for health care costs and those problems are not being addressed. Since Massachusetts health insurance costs are not competitive with Ohio, the logical conclusion for the average person is that the Massachusetts health care system is broken and future health care systems built along the lines of the Massachusetts system are doomed to failure, too. To paraphrase Albert Einstein, replacing a broken health care system with a more expensive, broken health care system and expecting different results, is a sign of insanity. ← TRANSPARENCY: School District Puts Checkbook Online….